Tahiti Nui, Hanalei – Open for more than 50 years, Tahiti Nui has long been a popular local spot but it’s even more famous since it appeared in the movie “The Descendants” with George Clooney. 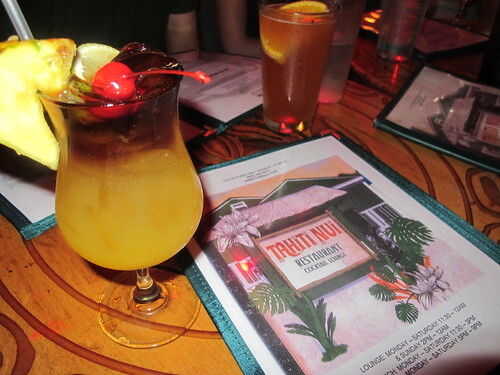 Tiki Iniki, Princeville – Musician Todd Rundgren and his wife, Michele, own this North Shore tiki bar that was built out by Bamboo Ben. 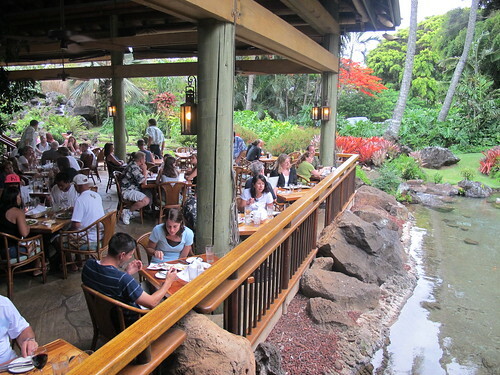 Keoki’s Paradise, Koloa – This touristy restaurant is not technically a tiki bar, but it does have a tropical feel with tiki torches, rock waterfalls, thatched huts and a lagoon. 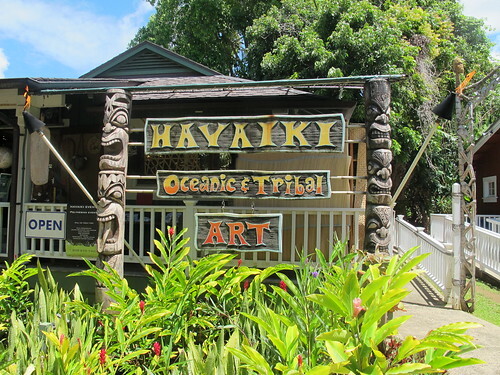 Havaiki Oceanic & Tribal Art, Hanalei – This gallery, named after the legendary homeland of Polynesians, specializes in traditional art from the Oceania region and points beyond. 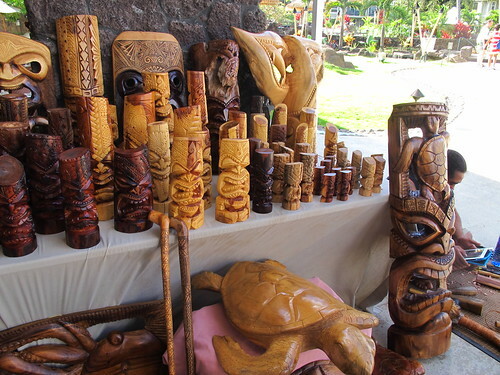 Aloha from Hanalei, Hanalei – You’ll find an interesting and varied selection of wares, from locally made soaps to Hawaiian salt and spices to vintage aloha shirts and tiki postcards and photo albums. Tiki Carver at The Westin Princeville – Everyday a couple local vendors would set up by the plantation-style main building of The Westin Princeville, and on the first day of our visit there happened to be a tiki carver. 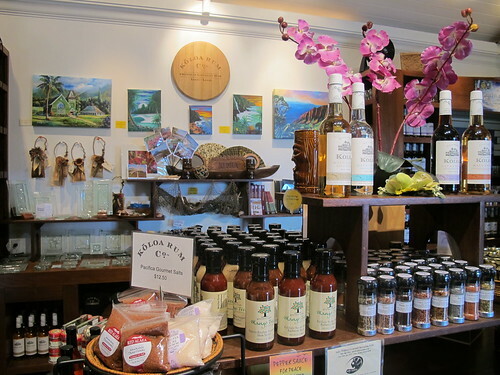 Koloa Rum Company Tasting Room & Shop, Lihue – This boutique rum company runs an impressive gift shop at Kilohana Plantation and offers free rum tastings in their adjacent tasting room. Ruins of the Coco Palms – An abandoned hotel wouldn’t normally be on my sightseeing list, but the Coco Palms is a notable exception. This filming location for “Blue Hawaii” with Elvis was damaged by Hurricane Iniki but it’s still sort of hauntingly beautiful. 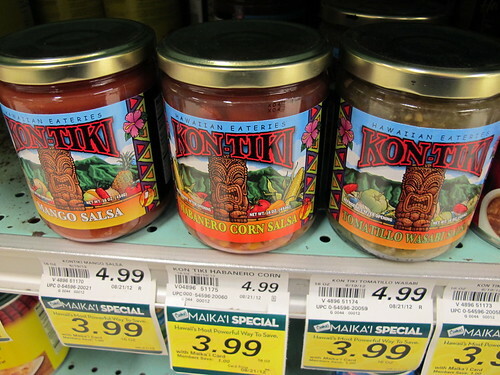 Foodland Grocery Store, Princeville – Of course there’s food at Foodland, but also souvenirs and products made from Hawaiian companies, including some that feature tikis in their designs. They also serve all kinds of delicious poke at the deli counter. The Mai Tai Lounge, Lahaina – This rooftop lounge had the best ocean views on the main drag in Lahaina — plus a few classic tiki drinks and pretty good food.